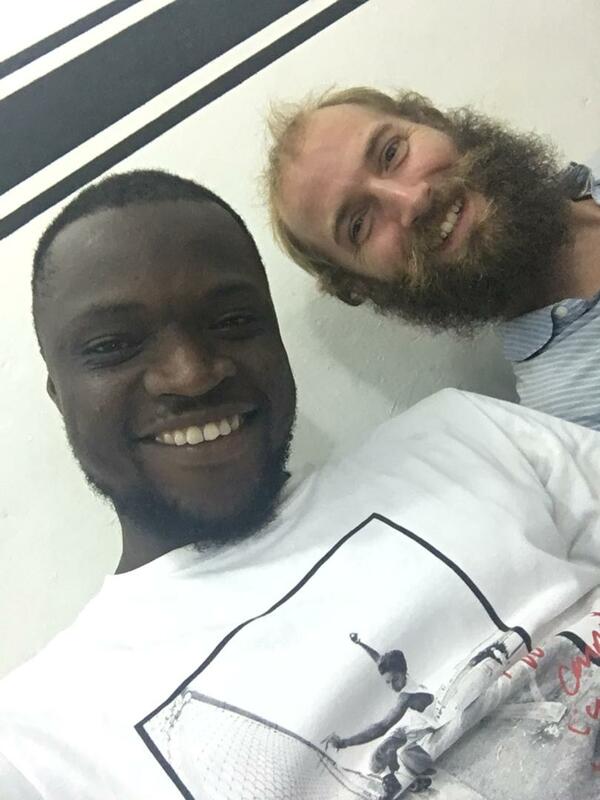 The previous night, I stayed with a gentlemen called Hamza in Accra. Hamza lives in the Nima town of Greater Accra. Some have described Nima as the second scariest town in Ghana. Nima is only a few miles from wealthy areas of Accra, which is a stark difference to Nima. After parking up, dropping my bag at Hamza's place, and his neighbour expressing an interest in marriage, we grabbed some food. 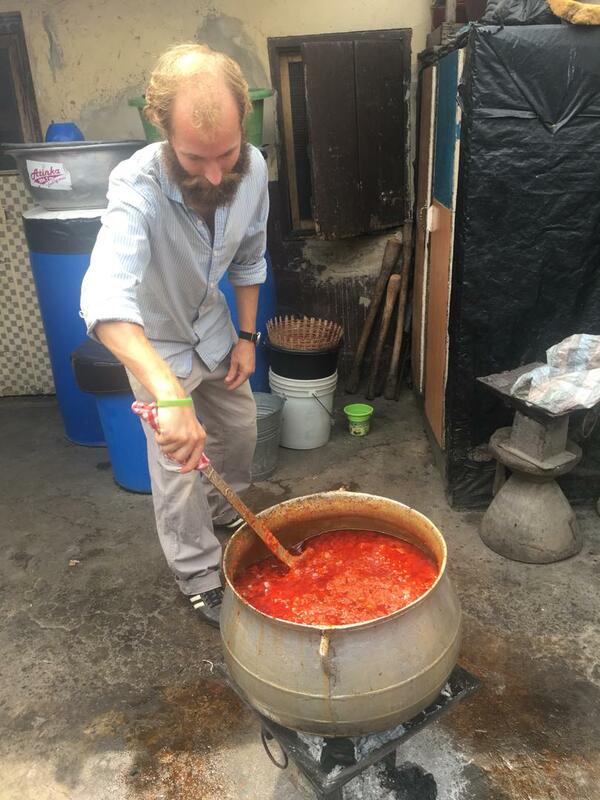 I ate fufu in a spicy soup with fish. No spoon, so I used my hands. Very tricky as it was soup and my beard didn't do me any favours. The vendor had water available for washing hands before and after, so in situations like this, it's best just to get stuck in! That evening, we hung out at his friends barbershop, and a friend also expressed interest in marriage. Felt very odd in the barbershop as Hamza's mates had well kept hair, but my hair and beard is the longest it has ever been! Most accommodation in Nima consists of a walled compound with multiple dwellings inside sharing a common space and a shower. Each dwelling is small. I stayed in a dwelling with two rooms, no toilet or bathroom, and no running water. Nima has public toilets, and the closest was a few minutes away. Before purchasing food, Hamza asked about the strength of my stomach for this reason! Water is run by pipe from a neighbouring compound and stored in many containers. Water can be available a few times a week and sometimes not for a week, so storage and prudent use and is key. During my stay, Hamza was incredibly hospitable and thoughtful. 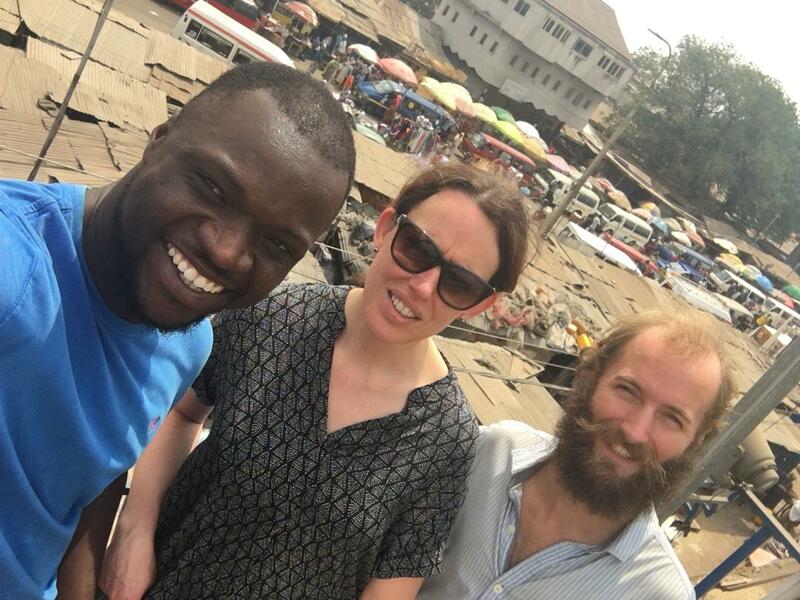 Hamza runs tours of Nima and further afield in Accra. I jumped at the opportunity to see more of Nima! Whilst Hamza was escorting another person to Nima for the tour, I saw these three girls dressed identically with slightly different shoes on their way to church, as it was a Sunday. They looked adorable! There are few roads through Nima. Instead, alleys connect residential compounds, mosques, churches, shops, the market, and so on. Drainage is a challenge in Nima. Many alleys had shallow, uncovered drains cut into the middle of the walkway. My eyes were constantly looking down checking my next steps! I never saw sewage from the public toilets, so I assume this is managed differently. Nima gutter has a large storm drain. The construction work for this had been on and off. Hamza expressed concerns over the inadequate government support that has led to weekly, community-driven cleanups. A few days later, I was walking on Independence Avenue which has government and financial offices, which was approximately one mile away, and there were numerous public litter bins on the avenue. Glad Hamza was with me day and night, as I would never have navigated out of the maze that is Nima. Hamza grew up in Nima and took us to his childhood home. His family even let me help with the cooking! The street art was awesome. Not everywhere, but this long wall had lots. Kwame Nkrumah led the Gold Coast to independence from Britain in 1957 to what is now Ghana. Stacks of coal for cooking lined this alley. Excuse my finger in the photo! There are few roads through Nima, so the centre is pretty busy! The market had live cows, goats, and chickens. There were stalls selling ingredients for spiritual ceremonies, which are not consumed. This included monkey heads, horse hair, dried chameleons etc. There market had a specific area selling different types of ginger. This truck was fully loaded with bags of ginger. The people of Nima come from various places, such as Northern Ghana, Togo, Burkina Faso, and Mali. This mosque was being extended upwards and its origin is Mali. Here's Hamza (left), fellow tour goer (middle), and myself (right). Outside of Nima, we briefly visited a coffin maker. These hand crafter coffins were tailored to something about the occupant to be. Here we have a lobster, a hair dryer, a cake, and a digital camera. I've noticed several funerals in Ghana since being here. What's caught my attention is the loud sound system at the wake. En route to the Coastal Camps, I passed wakes in towns and villages with music pumping out very loudly. Quite simply, it's just different to what I've experienced in the UK. This is the monument opposite Black Star Square. Black Star Square is where Independence Day parades are held. Across the road, there is a statue of a soldier opposite Independence Arch. We visited the Kwame Nkrumah Memorial Park to see the museum and also the final resting place of him and his wife.